Inscr. in red lower right: ‘G.F.Watts’. On reverse, canvas stamp: ‘Winsor & Newton’. 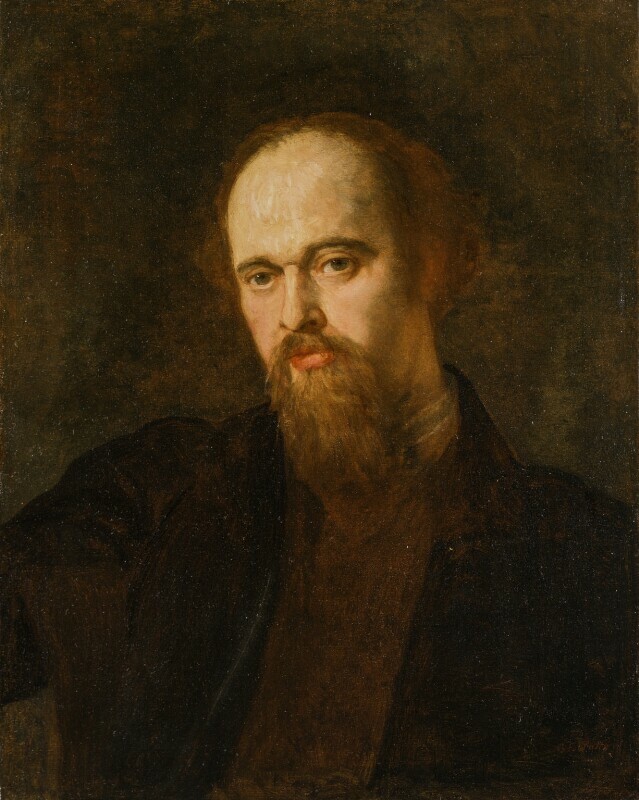 This portrait was intended for George Frederic Watts’s series now known as the Hall of Fame, but as it was never ranked highly therein it has been seldom reproduced or discussed; unlike others, it has therefore not become an iconic likeness of the sitter, despite the paucity of portraits of him. The previous year Watts had responded to a studio invitation from Rossetti with the words, ‘I have been constantly on the point of going to see you, as I am always anxious to know what you are doing, but you and I are not good at visiting! If I am able to get round to Cheyne Walk on Friday or Saturday it will be between 11 and 2…’ Late in life, he wrote to William Holman Hunt of the Pre-Raphaelite Brotherhood: ‘I should certainly have joined your Fellowship, being proud to remember I always understood and acknowledged its value.’  It is stated that he admired Rossetti’s poetry more than his painting,  and that the decision to paint the portrait followed shortly after the publication of Poems in late April 1870. The portrait appears to encompass both talents, however, emphasizing Rossetti’s domed forehead as well as his penetrating gaze. Moreover, Watts probably planned the portrait before the publication of Poems; his current group of sitters included Edward Burne-Jones,  William Morris (NPG 1078), John Everett Millais (NPG 3552) and Frederic Leighton, and he customarily spoke of Rossetti in equal terms, as an undoubted genius. Accordingly the other day I executed a coup de main. I took a spare chalk drawing, and sent [H.T.] Dunn with it to Little Holland House, sending him [G.F. Watts] also a note in which I said I would be much obliged if he would make an exchange as I wanted the portrait (not for myself) and that the bearer would call next day at the same time for it, to save him trouble. This resulted in my getting the picture next day, though poor W’s note with it plainly showed that it was even as a tooth out of his jaws. The proposed recipient of Rossetti’s gift is thought to have been his patron F.R. Leyland, who did not, however, acquire it at this date. It is unlikely to have been intended for Rossetti’s former companion Fanny Cornforth (later Mrs John Schott) but a year later he made it over to her, perhaps in lieu of a monetary gift, writing a formal note stating, ‘The portrait of myself painted in oil by G.F.Watts R.A. which is now at 16 Cheyne Walk is the property of Mrs Sarah Hughes and can be taken possession of by her at any time during my life or after my death.’  Although Fanny took possession of the work sometime between 1876 and 1882, the gift never seems to have been openly acknowledged. According to Rossetti’s brother William Michael, ‘My full and genuine belief is that Gabriel never gave it to Mrs Schott, but only, not much liking it, transferred it from his own hands and house to hers.’  It was not found in Rossetti’s house at his death. In fact, though the likeness is a matter of judgement, the technical aspects leave more to be desired. Owing to the absorbent ground and thin paint layers, varnish has penetrated the support, the image has become visible on the reverse and the paint surface is friable. In December 1895, the original was among the seventeen works (NPG 1000–1016, including portraits of Tennyson, Carlyle, Shaftesbury and Browning) presented by Watts – then a Trustee of the Gallery – in anticipation of its move to the new building in St Martin’s Place. Presumably around this date, it was reproduced in photogravure by Frederick Hollyer, one print being presented by William Rossetti to the city of Vasto, Italy, the Rossettis’ ancestral home. In 1923 the replica oil was bequeathed by Smith to the Walker Art Gallery (Liverpool M., 2134). In more recent opinions, the work has been seen through the lens of biography. It is noted, for example, that by 1871 Rossetti had ‘serious health problems’ and that the portrait records ‘signs of premature ageing … his hair is receding and his face careworn’. It is more likely that Watts intended the expression as pensive, with intimations of artistic contemplation. For whatever reason, the portrait remains relatively unfamiliar and is seldom chosen for exhibition or reproduction in relation to the sitter or the Pre-Raphaelite movement. 1) Letter from D.G. Rossetti to G.F. Watts, 18 May 1866; quoted Gould 2004, p.85 n.8; Fredeman 2002–10, vol.3, letter 66:103, pp.439–40. 2) Letter from D.G. Rossetti to F.S. Ellis, 12 Apr.1870; Fredeman 2002–10, vol.4, letter 70:92, pp.430–34. Watts is listed as the eleventh of 46 recipients. 3) Letter from G.W. Watts to D.G. Rossetti, 30 Mar. 1869; typescript in G.F. Watts correspondence album 5, f.214, NPG Archive. 4) Letter from G.W. Watts to W.H. Hunt, 1897; quoted Gould 2004, p.33 n.52. In 1903, Vanessa Bell reported Watts’s remark that Rossetti was ‘the greatest genius of them all’; quoted Gould 2004, p.348. 5) See Watts 1912, vol.1, pp.288–9. 7) Exh. RA 1870, where Rossetti admired it c.18 May. 8) Letter from D.G. Rossetti to Alice Boyd, 24 Aug. 1875; Fredeman 2002–10, vol.7, letter 75:110, pp.81–2. The drawing given in exchange was a chalk study for the subject picture The Roman Widow (now Fogg AM, Harvard, 1939.105); see Surtees 1971, no.236B. 9) Recipe given by Winsor & Newton, 28 July 1892; quoted Watts 1912, vol.3, p.69. 10) This account of the transaction all from letter from D.G. Rossetti to Alice Boyd, 24 Aug. 1875 (see note 8 above). 11) Letter from D.G. Rossetti to G.F. Watts, 26 Aug. 1875; first published Watts 1912, vol.1, pp.267–8; Fredeman 2002–10, vol.7, letter 75:112, pp.82–3. 12) Letter from G.F. Watts to D.G. Rossetti, 27 Aug. 1875 (now MSS Coll., U. of British Columbia L.); quoted in full Watts 1912, vol.1, pp.268–9; and Fredeman 2002–10, vol.7, letter 75:112A, p.84. 13) This is stated in the MS catalogue compiled by James Smith, now in Walker AG archives (see Morris 1996, p.493 n.4) and accords with Leyland’s relationship with Rossetti in the 1870s. 14) D.G. Rossetti, unaddressed signed document, 3 July 1876; Fredeman 2002–10, vol.7, letter 76:103, p.289. Fanny Cornforth’s legal name at this date was Sarah Hughes; later, after her first husband’s death, she married John B. Schott. 15) Letter from W.M. Rossetti to T. Watts-Dunton, 18 June 1883; Peattie 1990, no.369, p.451. It is evident that William was unaware of his brother’s document of 3 July 1876 (see note 19 below). 16) For information on the efforts of Frederic Leighton, PRA, to secure this loan, see letter from W.M. Rossetti to his wife, 20 Aug. 1882; Peattie 1990, no.355, pp.435–6. In the RA exhibition it was credited to the collection of Mrs Schott and dated to ‘about 1865’, which suggests that Watts was not consulted. 17) ‘…some strictly her property, others no doubt not so in reality, but allowed to pass unchallenged as if they were’ (W.M. Rossetti Diary, 22 May 1883, quoted Peattie 1990, p.436). 18) Letter from W.M. Rossetti to T. Watts-Dunton, 18 June 1883 raising the possibility of ‘awkward questions’ which would damage the ‘pretty little subscription-list for the engraving from that portrait’. See also notice cited in Troxell 1937, p.77. 19) See Watts 1912, vol.1, p.269; cf. the similar provenance of NPG 3033. Hearsay recorded by W.M. Rossetti indicates that Leyland sought to purchase the portrait from the Schotts in 1882, but declined to pay the asking price of £200 (see letter from W.M. Rossetti to his wife, 20 Aug. 1882; Peattie 1990, no.355, pp.435–6). 20) Rossetti 1889a, pp.138–9; the words ‘the shadow nor the solitude’ are from Shelley’s The Triumph of Life. 22) Athenaeum, 5 Dec. 1891, p.769. 23) Letter from W.M. Rossetti to G.F. Watts, 30 Dec. 1891 (now MSS Coll., U. of British Columbia L.); extract quoted Gould 2004, p.260; first published in fuller version Watts 1912, vol.1, pp.269–70, where dated to 1892. 24) Letter from W.M. Rossetti to G.F. Watts, 14 Apr. 1892; Peattie 1990, no.470, p.551. 25) Letter from G.F. Watts to J. Smith, 10 Jan. 1893, typescript in G.F. Watts correspondence album 14, f.21, NPG Archive. It is thought that Smith acquired both the replica and another work by Watts for £200; see Morris 1996, entries for WAG 2134 and WAG 2106 (I’m afloat, showing a putto on waves), pp.493 and 499, citing correspondence between Watts and Smith 1892–3. But Smith bought several works from Watts at this period and the original/replica exchange may have been a simple one. 26) Extract quoted in Myers & Co., Catalogue of Autograph Letters etc., Spring 1954 (529). 27) Letter from G.F. Watts to J. Smith, 10 Jan. 1893; typescript in G.F. Watts correspondence album 14, f.14, NPG Archive. 28) Used in 1899 for the first catalogue raisonné of Rossetti’s work by H.C. Marillier. Hollyer’s photograph of the painting was reg. for copyright 1907 Aug. 29: National Archives (COPY 1/512/308). Head-and-shoulders, turned slightly to left, fresh complexion, grey eyes, brown hair and beard, wearing black coat over indistinct brown garment, right arm raised over back of upright chair. The artist, from whom acquired by sitter by exchange 1875; Fanny Cornforth; bought ‘from a pawnboker’ by F.R. Leyland, c.1883; his sale 28 May 1892 (47); bought James Gow; bought James Smith, Blundellsands, near Liverpool; returned to artist by exchange; presented 1895. Dante Gabriel Rossetti retrospective, RA Winter Exhibition, London, 1882–3 (344). Treuherz et al. 2003, fig.86. Marillier 1899, frontispiece (from photogravure by Frederick Hollyer). The Bookman, December 1900, p.81 (photograph by Frederick Hollyer engr. ‘Exemplar’).